A common complaint among women is problems with their fingernails. One particularly common sort of problem is when nails become weak and brittle, which can be annoying even when the nails do not break because of it. While this condition can be frustrating, knowing the causes of brittle nails and some management options can help prevent it from causing too many difficulties. There are many different types of issues that women may face when it comes to their fingernails; problems can range from splitting and peeling nails to cracked nails to ridged nails. Weak and brittle nails are nails that have lost their normal strength, making them more prone to breaking off in annoying and sometimes painful ways. Often, weak and brittle nails are also dry, thin, and soft, which contributes to the nails breaking. 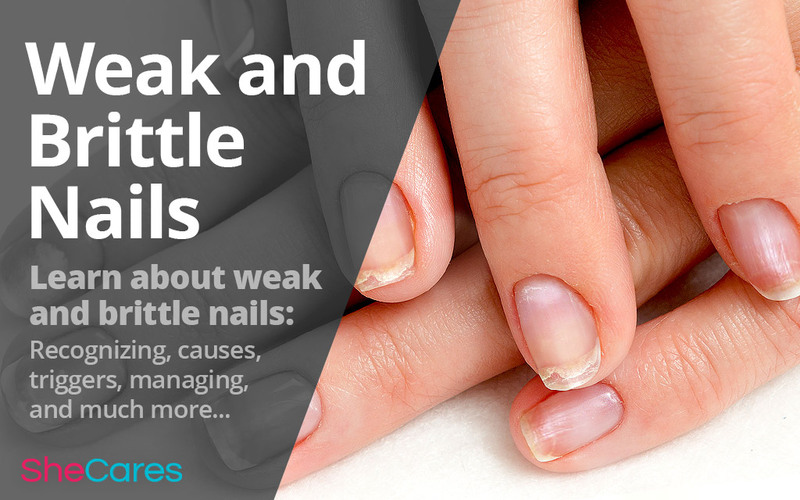 There are some underlying causes of weak and brittle nails that may make it more likely for this condition to present itself for certain women. Hormonal imbalance. The most likely reason for brittle nails in women is hormone fluctuations. Changes in the nails have been observed throughout women's lives. Some researchers have found that decreased estrogen levels affect nail growth. Lack of vitamins. One common problem that may affect nail strength and health is vitamin deficiency. Certain nutritional components - like vitamin E, iron, biotin, and calcium - are crucial to nail development. Without high enough levels of these necessary nutrients, nails weaken over time. Thyroid problems. Thyroid diseases - such as hyperthyroidism or hypothyroidism - may cause brittle nails or splitting of the nail bed from the nail plate, a condition called onycholysis. Infection. Bacterial or fungal infection may cause a change in nail color or painful areas of infection under the nail or in the surrounding skin. Severe infections may cause nail loss. Aging. Growing older tends to cause nails to weaken - even transitioning through puberty can cause extreme changes in nail health and the speed of nail growth. Certain activities act as triggers and can prompt fingernails to begin to weaken and become brittle. This can be soaking nails in a manicure, spending long periods of time washing dishes, or doing anything else that keeps nails damp to fully wet for minutes to hours at a time. This affects how the nail is shaped, which causes structural damage and weakness, and it also makes the nail more likely to become chronically dry. These chemicals can be solutions like common household cleaners - which will damage nails when used with bare hands - or other industrial chemicals, such as those used to wash dishes. However, even something as innocuous as nail polish contains chemicals that may be damaging to nails over time. Nail polish remover and the adhesive used for fake nails may also harm the nail bed. Keeping the triggers of dry, weak, and brittle nails in mind, there are a few ways to protect nails from these activities. When doing household chores like washing dishes or cleaning with harsh chemicals, using rubber gloves can help to keep the nails safe from the drying effects of those two activities. Using nail polish too often for too long will increase the fingernails exposure to the chemicals in the nail polish. Removing nail polish only to replace it with a new color doubles up on these bad chemicals, as the nail polish remover is damaging as well. Five-free nail polish is a type of polish that has been made without the use of five specific harsh chemicals that can damage nails. While using these polishes can still dry out nails, they are less likely to cause as much damage as regular nail polish. Understanding the underlying causes and triggers of these conditions can be useful for managing them, but there are many different methods for improving symptoms of brittle nails. To learn more about nail issues, read all about the many facets of nail problems.